This tilapia recipe I think is the tastiest among the tilapia dishes I tasted. This recipe, is a Kapampangan cuisine which I learned from my wife. Anyway this dish is very simple to make so don’t be discourage to cook one by yourself. The hardest part is dressing or cleaning the tilapia but now a days every wet market sellers will do the dirty part for you so the only thing you are going to do is put the stuffings inside and wrap the tilapia with banana leaves and then fry the fish. 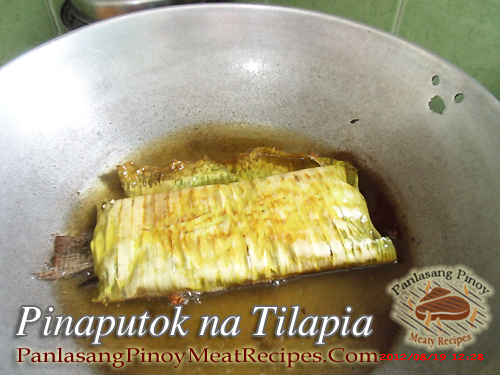 To cook pinaputok na tilapia; Prepare the cleaned and scaled tilapia by cleaning it after you bought it from the market. I don’t like to emphasize it further but for the sake of clear instruction, be sure that the fish was sliced at the back to get the internal organs out. So that way you can put the stuffing inside. If the cut is at the abdomen, the fish will look messy. Clean the tilapia in running water and drain. Rub every fish with rock salt then set aside. Prepare the stuffing by combining the onions, tomatoes, celery, patis and magic sarap. Mix thoroughly then fill each tilapia with the stuffing using your hands and a spoon. Then wrap each fish with banana leaves. You don’t need to wrap it like a package, see the photo below so you can picture it clearly. Heat the cooking oil, about 3 to 4 cups in a frying pan. Then put fish and cover it immediately because you might be spilled with boiling oil. 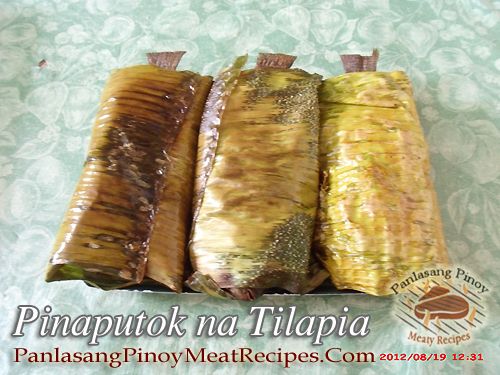 That is why is is called pinaputok because of the fire cracker sound while frying the tilapia. When there is no cracking sound already, about 2 to 3 minutes, turn the fish on the other side and watch out again and cover the lid. After 2 to 3 minutes, it is ready to serve. Prepare the cleaned and scaled tilapia by cleaning it after you bought it from the market. I don't like to emphasize it further but for the sake of clear instruction, be sure that the fish was sliced at the back to get the internal organs out. So that way you can put the stuffing inside. If the cut is at the abdomen, the fish will look messy. Clean the tilapia in running water and drain. Rub every fish with rock salt then set aside. Prepare the stuffing by combining the onions, tomatoes, celery, patis and magic sarap. Mix thoroughly then fill each tilapia with the stuffing using your hands and a spoon. Then wrap each fish with banana leaves. You don't need to wrap it like a package, see the photo below so you can picture it clearly. Heat the cooking oil, about 3 to 4 cups in a frying pan. Then put fish and cover it immediately because you might be spilled with boiling oil. 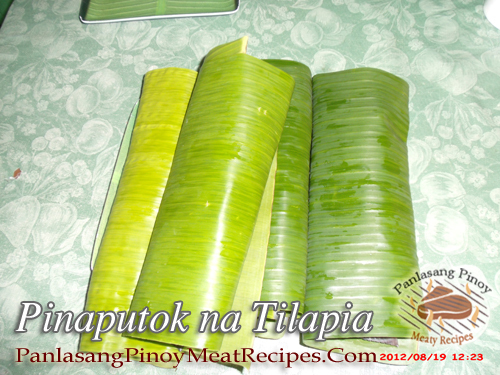 That is why is is called pinaputok because of the fire cracker sound while frying the tilapia. When there is no cracking sound already, about 2 to 3 minutes, turn the fish on the other side and watch out again and cover the lid. After 2 to 3 minutes, it is ready to serve. Mukhang masarap medyo madali namang gawin. thanks to this recipe.